Assemble the pastries: Lay a single layer of phyllo on a flat surface. Brush the sheet with melted butter. Fold in half, lengthwise, and then again. 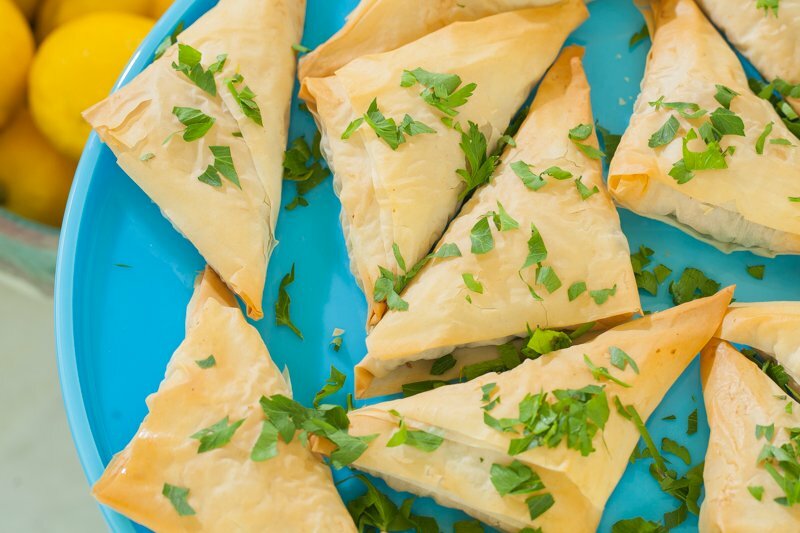 Brush a little more butter on the phyllo, and place a heaping spoonful of filling near the right corner. Fold the corner so that it makes a triangle. Continue folding triangles (as if you are folding a flag) until the edges are completely sealed. Repeat with the remaining filling and phyllo. Brush the tops of the pastries with a little more butter. These can be refrigerated or frozen o bake later. When you are ready to bake the pastries, preheat oven to 400. Bake for 15-20 minutes until golden brown and crispy. Allow to cool for a couple of minutes, & serve scattered with any fresh herb you have on hand.